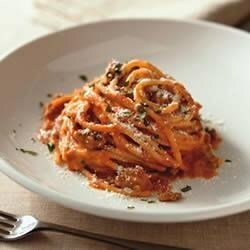 "Your favorite spaghetti sauce gets a delicious make over when combined with cream cheese and cooked ground beef. It's mixed with hot cooked spaghetti for an easy supper." MEANWHILE, brown meat in large skillet. Stir in sauce and cream cheese; cook on low heat 3 to 5 min. or until sauce is well blended and heated through, stirring frequently. Cook 1 cup each chopped bell peppers and onions with the ground beef. This wasnt as good as I wanted it to be. I added vegitables like peppers, onions and mushrooms.